I was very lucky to win the Wellington Pattern Pyramid from Laura over at Make it Yourself Mom’s Diary. Laura also gave me a very cute card and some lovely stretch cotton floral print fabric. 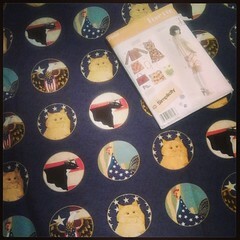 Love this Fabric from Laura! This Pattern Pyramid originated from the Wellington Blogger’s Meetup, in New Zealand, where they met up, exchanged sewing supplies and had many patterns left, with no takers. So, Miss Joie De Vivre at A Charm of Magpies, began this Pyramid. It then made its way to Anne from Pretty Grievances. Next up, the lucky winner was Laurie and Kerrielee from Sew Exhausted who then passed it over to my predecessor, Laura. Now, it’s my turn to pass it along to all of you! 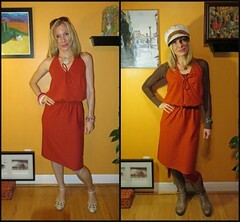 These are the 3 patterns I am taking out: (I was quite thrilled that so many patterns were my size!). There was a sailor style /diaper closure culottes pattern that is so fantastic!! Version C has an inverted pleat at the sides. I can’t wait to make these! And, I’m also helping myself to a yoga collection and a pretty yet simple dress. I have included the Vogue coat that I received in a giveaway from Mari at Disparate Disciplines which caused some definite excitement in this post. But, the pattern is several sizes too big for me, and I am finding Vogue patterns difficult enough without the added stress of having to grade it down. So, instead I thought I’d share it with those who can use it! I also included a stylish Vogue skirt pattern with a yoke and pockets, but yet again, it is too large for me. And, a McCalls blouse pattern that includes 8 different styles. And, here are two Extra Special Bonus patterns that I will also be adding in: Very cute 1970s wrap skirts with pockets. The instructions are in French only and I have labelled them in case the winner does not read french. Small Sizes 6 to 12 (32 to 40) That Threads dress is just beautiful! 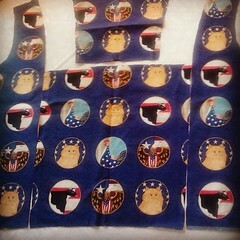 And the New Look vest is really cute if you disregard the envelope styling. The Butterick pattern includes the dress, jacket and pants. Medium / Large Sizes 12 to 22 (38 to 48). The Simplicity pattern (top row) actually includes the skirt, top, jacket, pants AND purse! A wardrobe in one. And the Vogue Five Easy Pieces pattern includes zip jacket, top, skirt, dress and yoga pants. An entire outfit. That Simplicity dress / top is the Khaliah Ali Collection. Mens and Accessories Pattern. Accessories are “one size” and the mens jacket is Size 38. Anyone, anywhere can enter the giveaway by posting a comment below by Friday June 7, 2013. A winner will be randomly selected and contacted. I will then post (mail) the pyramid to you. Kitty is sharpening his claws in preparation for the next draw officiating ceremony!! Good Luck to Everybody! And, Happy Sewing. Also, check out Kitty’s last winning entrant selection from our previous Pattern Pyramid win, Kaitui Kiwi from The Curious Kiwi. She finally received the Pattern Pyramid and has it posted up on her blog, here. PS. Thanks for stopping by and letting me know about the pattern pyramid! Anytime! Glad you stopped by and good luck to you! I know, right!? Thanks for starting this. I’m excited to see where the Pyramid will travel next! I am thrilled to bits for whoever added in that culottes pattern. I love it and it is my size!! Yay! Check back in a few weeks to see Kitty do the ever exciting draw and see who wins! That culottes pattern was from the original pyramid and the one I was most tempted to keep. But I’m pretty sure it wasn’t my size and I decided to share the love. So glad it has its new home! I am SO looking forwrad to seeing what Kitty gets up to for this giveaway! i would love to enter the pattern pyramid! I’d love to be in with a shot, those 70s wrap skirts are gorgeous! Oh, my! Call out the Japanese National Guard- this is the Godzilla of pyramids- it will not be stopped! Whats bigger than a pyramid- is Kitty going to have to select a winner for a pattern Monolith?? Kitty is always ready for ANYTHING!! Kitty cannot be taken unawares- far to zen for such! Hi hi hi, I am entering too! Please kitty, pick me, pick meeeeeeeee! 🙂 Kitty would like to inform you that bribes will not be accepted during the draw officiating ceremony. Tummy rubs, however, always accepted. I’d love to join in the fun! Fun fun fun! Can not wait to see how Kitty chooses! Kitty put my name in that hat!!! That wrap skirt you put in is sooo cute!! I want! My comment is: Wow! What a treasure trove. I’d love to be the next link in the chain. Oh! I wanna enter to the pattern pyramid! Enter me pleeeeease, there are several fun looking projects there. I want to enter! This sounds fun, and I definitely have a couple of patterns I could add! I won Joy’s OTHER pattern pyramid around Christmas, but I don’t care! I want to win this one too! Hee! I did not realize you won her other Pyramid. But, you know what? Pattern Pyramids are here for everybody’s enjoyment, and it’s not like you are keeping the whole thing. You will be exchanging and passing along the fun to the next person, so absolutely no reason not to participate!! I really like the Sundress Pattern you’ve picked out. I can’t wait to see what you make. I bought a vintage pattern while at a little antique store with Alys in San Jose. It’s a A lined house coat and I hope to use a vintage Chenille spread I got at Goodwill. It was on 7.99 and queen size….you just can’t buy material that cheep. It’s in really good condition so I don’t know if I can bring myself to cut it. Yay I remember that coat pattern, it is gorgeous! There’s a lot of great patterns there, the Khaliah Ali pattern is also one of my favourites 🙂 My mother made me a pair of culottes ages ago (ankle length) in a purple thin knit (not very stretchy), and I loved it so much I wore it to bits, so I think you made a really good choice when picking that one. We call those trouserskirts/pantskirts in my country, haha!Thanks for letting me know so I wouldn’t miss it, and a bellyrub for Kitty! These patterns look so interesting, I hope they find their way to good homes. Don’t enter me for this draw though, I already have way too many projects in the air. You are counted and up and running now! Oh I’m sad that the Vogue jacket is also not my size…. but I’d still like to enter for the giveaway! The wrap skirts look cute. Wow, loads of good stuff in there! And it’s worth entering just to see Kitty doing the draw again. I finally understand what a pattern pyramid is (I was so confused about why they kept getting bigger!). So, I’m in. Yay Charlotte! Actually, the goal of the Pattern Pyramid is to have it shrink to ultimately nothing. However, some people choose to put a pattern or two back into the Pyramid to keep it going longer. This particular one, somehow was radiated in the winning and shuffling process, and it has more than tripled in size!! Normally, they are not this large as it gets cumbersome to post after a while. But, it does make the selection a lot more fun!! As ever I am loving you blog! I would love to enter if I am not too far away! As long as the post will carry it there, it’s never too far away! Ooh I would love to enter, have a load of patterns I could add too!! Oh goody! Some nice patterns in there- would be very exited if kitty chose me! Please please please kitty, choose me! I’ve already posted the Pattern Pyramid to the winner, Fiona, and I’m sure you can enter to win it when she posts it on her blog. Good luck to you! !